As mentioned, they covered almost everything of which you might have thought (bar one glaring omission that was rectified afterwards), from development to characters to plot. The Town Hall was split into two sections, the panel discussion and a Q&A session which will both be covered below! For those of you who have been following the blog or IDW Sonic news in general, I will highlighting new info in bold so that you can quickly find it amid the majority of repeated information! The panel initially discussed an overview of the first 4 issues, who worked on them, and what to expect in April. 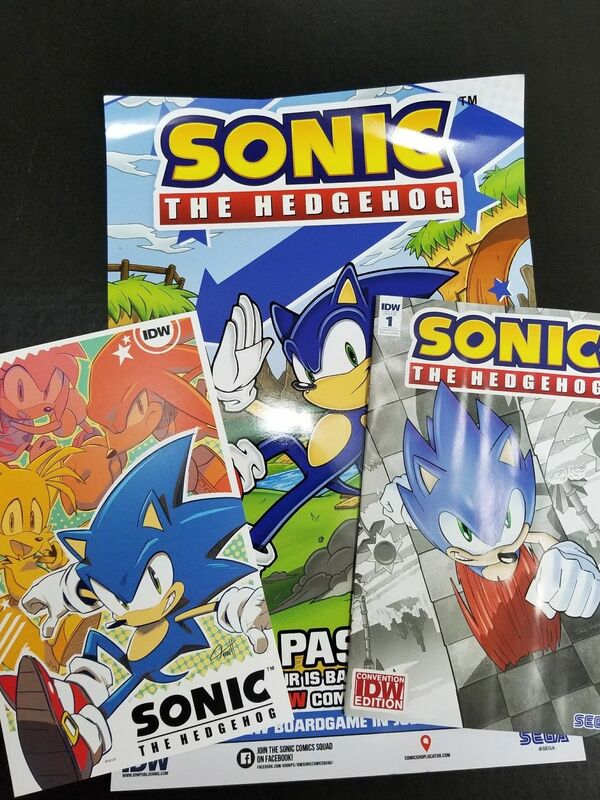 They were happy to announce that fans would be rewarded for their patience during the long absence of Sonic comics with 4 issues coming out weekly in April. This fast-paced launch will allow a full 12 issues to come out in 2018! They also reminded attendees that those who purchased the black & white Tracy Yardley #1 variant are literally the first people to read the new series! Each of the first 4 issues will show Sonic travelling around to various cities and towns to clean up the badnik forces left behind by the Eggman Empire. At each stop he will encounter a different friend or make a new one in the case of Tangle, when he arrives at her home town in issue #4. As was alluded to way back in the #2 solicitation, IDW Sonic will indeed start in the aftermath of Sonic Forces, but in its own separate continuity unique from the games. There seemed to be some contradictions on this issue between Flynn and the editors when fans asked about this idea in the past, but it seems they are all on the same page now. Issue #1 will focus on what makes Sonic and Tails the iconic and dynamic duo that fans know them to be. This should assuage the fears of fans concerned that we will see the unpopular iteration of Tails from Sonic Forces. Issue #2 will lay out the definitive characterization of Amy Rose going forward in the IDW series, and according to Joe who said after reading issue #2 that Amy is now his favorite character, I have a hunch we are going to like the new Amy. Ian described her as being characterized as an individual and a combatant like we have never seen before. Issue #3 will be a buddy brawler, pitting Sonic & Knuckles against another challenging duo, Rough & Tumble. Comparing the new villains to another iconic IDW duo, the editors mentioned that the Skunk brotheres are approximately 12% smarter than Beebop & Rocksteady! David also point out the Easter egg that it will be Sonic (Issue) 3 & Knuckles! Issue #4 will have Sonic meeting Tangle as he helps defend her home town from badnik forces. Also, Blaze will be making appearance, but what will her arrival from another dimension mean for the series? The panel also divulged some other interesting behind the scenes tidbits included that they did their best to match artists whose personalities matched the characters they were featuring in that issue. Moreover, a new staff member was mentioned, Heather Breckel who previously worked on the My Little Pony series will be coloring issue #3 with Jen Hernandez. Concerning cover artists, they also discussed how IDW came across the stellar work of Nathalie Fourdraine and got her on the team. They also confirmed that she will be doing variant covers at least through issue #7! They also revealed several previously unseen variant covers, none of which could be easily made out from their Power Point presentation during the live streams. Rafa Knight’s #1 variant was shown, presumably it was a 3D model of what looked like a close up of Sonic and Tails together. Likewise, Hesse’s #1 and #2 A covers were shown together with what looked like Sonic continuing to run along the Emerald Hill Zone. Hesse discussed some of the challenges in making these connecting covers, the main hurdles being making the first issue iconic while still connecting and the limitation of only illustrating the featured characters on each book. The panel shifted to talking about plot momentarily with Flynn talking about how despite Eggman’s disappearance it is reasonable for his large empire of mechanized minions to still be causing trouble in the aftermath, but that through the course of the first 4 issues, their behavior will have an odd and subtle shift alluding to something deeper going on in the shadows! Flynn had previously mentioned in BumbleKast 64, that there is returning antagonistic force looming that fans will be able to discern. What this is remains to be seen, but it appears to be affecting the badniks! The panel spoke on how the book is aiming to be a balance of old and new. Rewarding long time fans with references they can pick up on, but also adding fresh and new elements for new and old readers alike to grab onto. They then talked a bit about character design, particularly about Rough & Tumble. Hesse spoke on how they were originally quite different from the designs we have seen, but were brought back in line with some feedback from SEGA. Hesse mentioned how he loves the look of albino skunks which became an inspiration for Tumble’s design. Moreover, they noted that Tumble’s tail is short. Originally it was going to be hairless, but they found it too disturbing, and instead decided that he had somehow lost it. Perhaps we will find out just how that happened one day! Next they discussed the second arc starting in May, “The Fate of Dr. Eggman”. At the end of Forces, Eggman is gone and issues #5 and #6 will reveal what happened to him. Flynn talked about the risk of not featuring Sonic’s greatest foe until 5 issues in, but that since 4 issues are coming out in April alone, it will not be that long of a wait! Likewise, they spoke on the continued introduction of characters like the Chaotix, Shadow, and Rouge, adding that for the first year there will be another character introduced or reintroduced each issue! Finally, before the Q&A, they talked about a couple of other merchandise opportunities that come paired with variant covers. The first is the Crash Course board game. Those who pre-order it from GameStop will receive a black & white Kieran Gates #1 variant. Also they mentioned the bundle previous announced at the SxSW panel last week. Available exclusively at the SEGA Shop in limited quantities is a bundle that includes the A covers for issue #1-4, a special variant of #4, and a mystery T-shirt that the panel assured attendees that they would want. As with the Panel section, I will be doing a synopsis of each question as there was not really much new information gleaned from them! On the topic of whether we will see other writers join the staff, the panel answered with a definite yes, Sonic fandom is full of smart, passionate people that they know have great stories to tell. From their response it seems likely that if the main book is successful we may see a Sonic Universe type book or other spin-off series in the future. This also addressed another question regarding whether other characters would get the spotlight. The individual did not specify if they meant spotlights, featured characters, side stories, or expanded universe books, but again the panel touched on the fact that there are a lot of amazing fans with amazing stories to tell. A question regarding SEGA’s famous mandates and what the weirdest one they were given was answered by the panel in a reassuring fashion. Joking about how male characters can not wear pants and how Sonic cannot drink (or vote) since he is underaged, they affirmed that all companies who license their IPs have a style guide and rules about using their characters for the protection of their brand, but that SEGA has given Ian and the rest of the team a lot of freedom and has been working closely with the team. One fan asked if the black and white variants were a nod to the grayed out Green Hill Zone in Sonic Generations (despite it actually being the Emerald Hill Zone on the covers), but David said it was just a coincidence and that the color change is just a common variant cover gimmick due to certain time constraints. The Two-Worlds Theory was once again brought up in the form of a question regarding if we would see any humans in the IDW book besides Dr. Eggman. Flynn responded with a resounding “Eventually”. Hesse was asked about his involvement with the Sonic franchise, asking what else he is working on. Hesse admitted he was working on “a lot” including Mania, Mania Adventures, and IDW. He also responded to a request for more appearances of Classic Amy by urging fans to be vocal about what they want because SEGA is indeed listening. The panel also clarified that Mania is not connected to IDW, but that Flynn would welcome a Classic Sonic themed book. When asked about the workload in creating the new comic, Hughes cited that it was the busiest he has ever been in his professional career, but is very happy about how the books have come out so far. In perhaps the most touching question of the day, an 8-year-old fan asked Hesse how he can become fast at drawing Sonic. Hesse told the boy that he started drawing Sonic at about the same age and to draw him everyday and even invited him to the table after the panel to show him how to draw Sonic. Finally, the panel was asked what characters they would like to see in the book, and Mighty and Ray, who were just announced in Mania+ were proffered by the David. Unfortunately, they are still relegated to Classic Sonic, and thus will not appear in the Modern styled book at the moment. However, Joe voiced that he was outraged Big has yet to be announced to make an appearance! Surprisingly, no one asked about the Freedom Fighters! But TSSZ news caught up to Hughes afterwards and asked if we would be seeing them anytime soon. His answer while still not definitive was that we will not be seeing them in 2018, but they are not off the table. Again, it is clear IDW at least wants to set the tone for their own book before bringing back characters with such complicated backgrounds. Well! The official launch is just over a week away now, but I have been lucky enough to get my hands on one of the WonderCon variants! As eager as I am to share everything with you, I will not be doing a full review until next Wednesday. However, I will be releasing a non-spoiler review to give you all my initial impressions without giving any plot away whatsoever! Stay tooned for that sometime later today! Previous WonderCon Has Begun! Issue #1 Arrives! Thanks! I couldn’t find a proper coverage of Wondercon anywhere else!